With adjustable recline positions for your child as well as ease of installation for you. BeSafe iZi Flex FIX i-Size - Safety and flexibility combined. Suitable from 4 - 12 years, 100 - 150cm in height. BeSafe welcomes the newest child car seat regulation UN R129-02 by presenting the first booster seat on the market that fully complies with the new safety requirements. 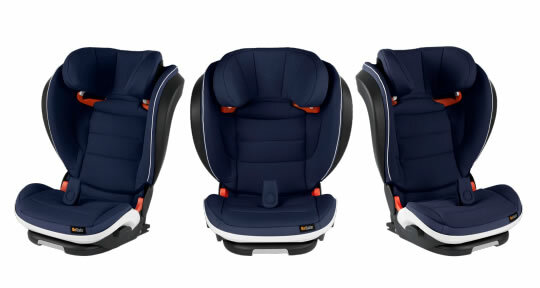 Developed for real-life situations, this new BeSafe high back booster seat protects your child with safety features that even go beyond what is required by the regulation. Thanks to its smart features for comfort, safety and space flexibility, the iZi Flex FIX i-Size won the prestigious Kind + Jugend Innovative Award in the category «World of Travelling Kids». Experience from the BeSafe pregnancy belts has inspired the development of the foldable lapbelt guider. Made of soft materials, this integrated solution helps with an optimal positioning of the lapbelt and also increases comfort. A fid-lock magnet makes opening and closing it easy. Similarly, lockable shoulderbelt guiders at the headrest ensure that the shoulderbelt is always at the right height for the child. Installation: 3-point vehicle belt or Isofix in combination with 3-point vehicle belt.